I am fortunate enough to have four of the most beautiful grand daughters in the world. Tannikah, Lauren, Ava and Zaliah. Unfortunately I don’t have lots of photos of Lauren, Ava and Zaliah. (their Dads will have to remedy that!) However Tannikah’s mum (my daughter Aedita) is a photographer so I have lots and lots of photos of the gorgeous TK. This page is her tenth birthday. She had only just moved to Brisbane and in a short period of time made three great friends. Bridget, Imogen and Ashley. Don’t they look glamorous??? Do you remember turning 10? Do you remember being “double digits” at long last? It was a long time ago for me, but I remember that day as it being quite a milestone. At the top of the journaling block I’ve left a spot for Aedita to print the girl’s names. I’ve pencilled them in, but my printing is no where near as good as Aedita’s. OK now. Chop, Chop Joe and Jason I need photos of those beautiful girls. PLEASE??? Well looky who’s caught the scrapbooking bug! 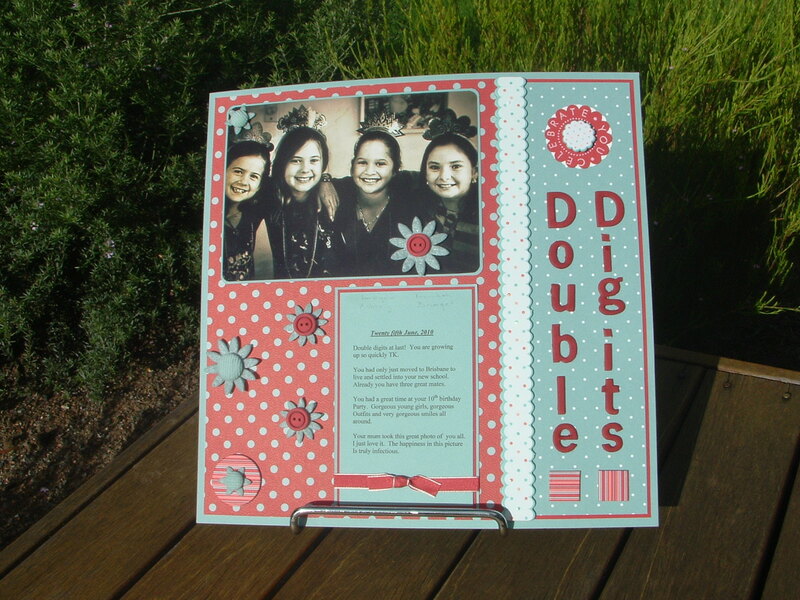 !So good to see all this scrapbooking. Just gorgeous Jacqui.